My first ride to Teluk Intan, in 2016, was along Federal Route 5, which is one of three north–south backbone federal highways in Peninsular Malaysia. Which makes it a heavily-used road by all manner of motor vehicles. The road surface bears the scars of constant pounding by heavy lorries and buses. Which makes it less than ideal to cycle on. I rode to Teluk Intan twice in 2017, each time trying to find more and more secondary roads to ride on, as an alternative to Federal Route 5. It fell to me to plan the route for this ride to Teluk Intan. Ride With GPS has a route planning feature which is easy to use. My goal was to put us onto as many roads like this as possible. Smaller, scenic roads and paths, with very few cars or motorcycles. For the first 110km / 68mi or so, we rode on Federal Route 5 only when we had to cross a major river, e.g. the Sungai Selangor at Kuala Selangor, or the Sungai Bernam north of Sabak. We rode all but 13km / 8mi on these quiet, secondary roads. There were a few surprises though. We came upon a few sections where the tarmac turned into this. I had discovered, too late, that Ride With GPS will plot a route along any road possible, paved or otherwise. I now know that counter-checking a route generated by Ride With GPS with Google Map Street View is essential. All the laterite or otherwise unpaved roads and paths which Ride With GPS took us onto do not have Google Map Street Views. This check is easy to do, because Ride With GPS uses maps provided by Google Maps. So the small yellow Street View man is always available in the lower right corner of the map. The red line on the upper map shows the route we rode, as created with Ride With GPS. The blue lines on the lower map show where Street View is available. That section we rode, where Street View is not available, was a narrow, unpaved track. We were able to ride it, but it was a bit worrying on narrow 23mm or 25mm tires. I learned through experience that in future, I must avoid plotting routes on roads and paths where Google Map Street View cameras have not been. Despite the unexpected off-road bike handling skills tests, we all had a good time. Fortunately no one took a tumble or had a flat caused by the uneven surfaces, which at times were liberally strewn with sharp stones. As is par for the course with the R@SKLs, a long ride like this one required frequent refreshment stops. Breakfast was at 23km / 14mi. We had a 10am snack at 65km / 40mi. We made a slight detour to the beach at Sekinchan, to look at some of the catch being brought ashore at the jetty. And to pose under the “good luck” tree. The good luck tree didn’t work out for Simon. He had a flat tire at 89km / 55mi. It was lucky for the rest of us though. Simon’s flat was conveniently right next to this stall selling Air Batu Campur, which is a local dessert made of shaved ice coated with with brown sugar syrup, other flavoured syrups, and evaporated milk. Other ingredients are kidney beans, red beans, creamed corn, and crushed peanuts. While we were quenching our thirst, the stall owner told us that there was a restaurant 2km / 1.2mi away that serves very good mee kari udang lipan (noodles and mantis shrimp curry). It was 12.30pm when we got to that restaurant. Which, coincidentally, was when it opened. After lunch, we had just under 25km / 16mi, including another unexpected off road section, this time 3km / 2mi long, before we got to the bridge over Sungai Bernam. From that point we had no option but to ride along Federal Route 5, and then Federal Route 58 to Teluk Intan. Fortunately the roads north of Sabak are wide, the road surface is reasonably good, and the traffic is a bit lighter. The 55km / 34mi ride from our lunch stop to the Yew Boutique Hotel in Teluk Intan had worked up a thirst and hunger. It was three and a half hours to dinner. We needed something to keep our strength up until then. The famed Teluk Intan chee cheong fun (rice noodle roll, char koay teow, and a fermented barley drink did the trick. The main event was at 7.30pm, at Restoran d’Tepian Sungai. The udang galah (giant river prawn) feast. Clockwise from top left: curried, grilled, fried with turmeric, and in spicy coconut gravy. We made short work of 4 kilos / 9lb of Grade A prawns, plus fried mixed vegetables, omelettes, white rice, and three jugs of fruit juice. After all that food, I barely managed to ride my bike to the Menara Condong (Leaning Tower) for an illuminated photograph to go with the daytime shot we took when we arrived in Teluk Intan. The trip back to Kapar the next day was equally food and drink-filled. We had breakfast at the coffee shop across the street from the hotel. Our rooms came with breakfast, but the hotel starts serving at 7am. We had filled our bottles at the nearby 7-Eleven and were on the road by then. We skipped the off-road section between Sabak and Sungai Besar. I’m not convinced that the equivalent stretch of Federal Route 5 was any smoother. Our first stop was in Sungai Besar, 50km / 31mi into our ride. We had iced Milo, coffee, and roti canai. Our next stop was a sightseeing one. Our route along the coast took us past a small fishing jetty at Pasir Panjang. We put in a further 42km / 26mi before stopping again. This time for air kelapa (fresh coconut water). Most of us had two coconuts each. The air kelapa stand was 60km / 37mi from our Sungai Besar food stop. The guys were hungry. Mark and I knew that the Kuala Selangor McDonald’s was only 4km / 2.5mi down the road. A sundae was calling my name. Burgers, chicken nuggets, and fries were calling out to the others. The air-conditioning at McD’s was another attraction. It was pushing 30°C / 86°F, and it would get hotter. 40 minutes in cool air was a welcome respite. There was 35km / 22mi left to ride from Kuala Selangor to Kapar. Including another unexpected 2km / 1.2mi sandy and stony section. Fortunately it wasn’t wet like it is in this Google Maps Street View. Our tires survived the sharp stones. There was just one more section of Federal Route 5 to ride along. It is a toss up between riding to the right of the road shoulder, where the surface is cleaner but rougher, or on the road shoulder, where there is always a lot of debris. The heavy traffic often makes the road shoulder the safer option, but the risk of having a puncture is higher. My rear tire went soft. It was hot, and I was cheesed off at flatting with just 5km /3mi left to go in our 290km / 180mi round trip. In my impatience, I fumbled two changes, rendering both inner tubes unusable. Lay, Marvin, and Ridzuwan bailed me out with another inner tube, helping with the tube installation, and buying cold drinks from the petrol station across the road. The day ended well though. Simon got home with plenty of time before the concert he was going to that evening. There had been no falls or major mechanical issues. Everyone enjoyed the ride to Teluk Intan and back, despite the unpaved sections. And Lay, Wan and I had one more meal together before our day was over. Braised lamb shanks and cendols all round. Posted in Cycling in Malaysia and tagged Federal Route 5, Kapar, Kuala Selangor, Menara Condong, Restoran D'Tepian Sungai, Ride With GPS, Sabak Bernam, Sekinchan, Sungai Besar, Teluk Intan, Udang Galah, Yew Boutique Hotel. Bookmark the permalink. Keat Wong lined up as a member of team Flipside for many a ride in 2013, 2014 and 2015. By 2016 life was taking many Flipsiders in new directions, and our rides together became fewer and farther between. I saw less and less of some of the Flipsiders, including Keat, over the past couple of years. Keat and I did stay in touch, but our occasional meetings were over lunch rather than on a ride. It is sad that it took Keat’s untimely passing to bring a larger group of Flipsiders back together for a ride. At the same time, I am very happy that sixteen of Keat’s cycling companions were able to gather in his memory. Including some who literally dusted off long unused bicycles in order to honour Keat. We took a route that Keat rode with us many times. Bandar Sunway to Kota Kemuning for breakfast, and then on to Bandar Botanik and back to Bandar Sunway. There was only one choice of restaurant for breakfast. Pun Chun Noodle House. I had one of Keat’s favourite breakfasts. Duck drumstick noodles. We pedalled along roads familiar to Keat, and laughed and smiled as we talked about the good times we had shared with him. You will be sorely missed by all who rode with you. Posted in Cycling in Malaysia and tagged Bandar Botanic, Bandar Sunway, Flipside, Keat Wong, Kota Kemuning, Pun Chun Noodle House. Bookmark the permalink. My Flipside friends and I are deeply saddened by the passing of Keat Wong. I first met Keat in early 2013. I don’t remember the circumstances. Like most cycling friendships, I suspect ours began with an introduction by a mutual cycling acquaintance. Keat and I became members of Team Flipside. I remember lots of pre-dawn starts. We shared many pre, mid, and post ride meals. Keat brought much joy and laughter wherever he went. Lake Taupo Cycle Challenge. The Vätternrundan. The Silk Route. The Cape Town Cycle Tour. The list goes on. Whatever the challenge, you could count on Keat to make it to the finish. Keat you will be sorely missed by all who knew you, and who had the pleasure of your company on various bike rides. Posted in Cycling in Malaysia and tagged Wong Keat Soon. Bookmark the permalink. The Fiat Seicento, an update of the Cinquecento, is a classic of the automotive world. Dario Pegoretti, on the other hand, is a bicycle frame building legend. He is one of the most revered and respected steel frame builders in the world. His frames, exclusively in Columbus steel, are unique. Frames which are turned into works of art by paint that expresses his artistic passions. The Bike Artisans brought Dario to Kuala Lumpur to meet his fans, and more importantly, to take orders from aficionados eager to own a custom-built Duende, Mxxxxxxo, Responsorium, or Big Leg Emma frame. Over two days Dario measured and interviewed more than thirty individuals. He suggested which of his frames would suit each person’s build and riding style. Then, each customer had to decide whether to have that frame finished with a stock paint scheme, or to go for the “surprise me” option of a hand-painted Ciavete design. The Bike Artisans very kindly organised two events to mark Dario’s visit to Kuala Lumpur. The first was dinner on Saturday night at Timbre, conveniently located next door to the bike shop. It was an opportunity for Pegoretti owners to get their bikes autographed by Dario, for wish-we-were-owners to ogle the bikes and frames on display, and to get a photograph with the master. The second was the Pego-Raduno Asia Edition ride, from The Bike Artisans to Genting Sempah and back. It has been unusually cool over the past few days. Which helped make the Sunday morning ride very pleasant. The ride ended with a satay lunch outside The Bike Artisans. And the opportunity to look over what was probably the largest collection of Pegorettis ever assembled in Kuala Lumpur. The thirty or so who ordered frames now have a ten month or so wait while Dario cuts and welds tubes, and paints frames in his workshop in Verona. Perhaps Dario will visit Kuala Lumpur again at the end of the year to deliver those eagerly awaited frames. Posted in Cycling in Malaysia, Gear and Tools and tagged Big Leg Emma, Dario Pegoretti, Duende, Genting Sempah, Mxxxxxxo, Responsorium, The Bike Artisans, Timbre. Bookmark the permalink. I read a WordPress post by Tempo Cyclist the other day, where he described the first ride he uploaded to Strava. That got me thinking about all the rides I have uploaded to Strava over the years. Riffing off Tempo Cyclist’s post, I looked at my 1,000th ride on Strava. It was a ride to Genting Sempah, with good friends Mark and Ridzuwan, on 18th October last year. Coincidentally, my very first ride in Malaysia, after moving back home from the Netherlands, was also up to Genting Sempah, on 7th October 2012. The Genting Sempah climb is probably the most cycled route in the Klang Valley. I have done the Genting Sempah climb at least forty times since that first ride in 2012. There has always been dozens of other riders on Jalan Gombak with me. The climb is generally considered to be from the Hospital Orang Asli (HOA) to the flyover at the summit, which is almost on top of the border between the states of Selangor and Pahang. A lot of people start their ride from somewhere near the HOA. It all depends on where they can find a parking space. The ride to the flyover is very pleasant. It is usually quite cool and shady. The average gradient is about 3.5%, but with some kickers along the way to get the heart rate up. And traffic is usually fairly light, although occasionally there are car clubs or motorcyclists blasting up the hill..
A number of troops of monkeys live in the jungle lining the road. It is not unusual to see some during the ride. The bridge with 1.8km / 1.1mi to go to the summit is a convenient spot to stop to get your breath back before tackling the last two steep corners on the way to the flyover. Near that bridge, you get a good view of the Karak Highway, which replaced Jalan Gombak as the primary route between Kuala Lumpur and Bentong. Most riders turn around at the flyover. If you are hungry, there is a McDonald’s one kilometer down the other side of the hill, at the Genting Sempah R&R on the Karak Highway. We often start the Genting Sempah ride with the intention of going to the McDonald’s, but change our mind at the flyover. The prospect of climbing 64 meters / 210 feet over 1km / 0.6mi from the McDonald’s back to the flyover puts us off. If you want to go further afield for food, you can continue down the hill from the R&R for 5km / 3mi to the left turn to Bukit Tinggi, with its collection of kopitiams, or Hokkien coffee shops. A popular alternative is Janda Baik. Instead of turning left to Bukit Tinggi, you turn right and ride under this arch. My go-to place for breakfast in Janda Baik used to be Andak’s Place. Sadly Andak’s Place has closed down. An alternative is Kopi n Kraf. If you are looking for a longer ride, continue straight down the hill, past the turnings to Bukit Tinggi and Janda Baik, for another 30km / 18.6mi to Bentong. There are food choices for those who turn around at the flyover and head back down the hill. The food stall a few hundred meters from the HOA is a popular spot for a pre-ride or post-ride drink and meal. A few of us have taken to starting our ride to Genting Sempah from where I live. Which adds about 40km / 25mi to the 32km / 20mi from the HOA to the flyover and back. More importantly, it allows us to stop at Santa Chapati, near the Tawakal Hospital, for lunch on the way home. Good riding, and good eats. No wonder Genting Sempah is a favourite route. Posted in Cycling in Malaysia and tagged Bukit Tinggi, Genting Sempah, Genting Sempah R&R, Hospital Orang Asli, Jalan Gombak, Janda Baik, Karak Highway, Santa Chapati. Bookmark the permalink. Infographics make complex information eye catching, shareable and easily digestible. The best ones combine eye-catching graphics with interesting facts. 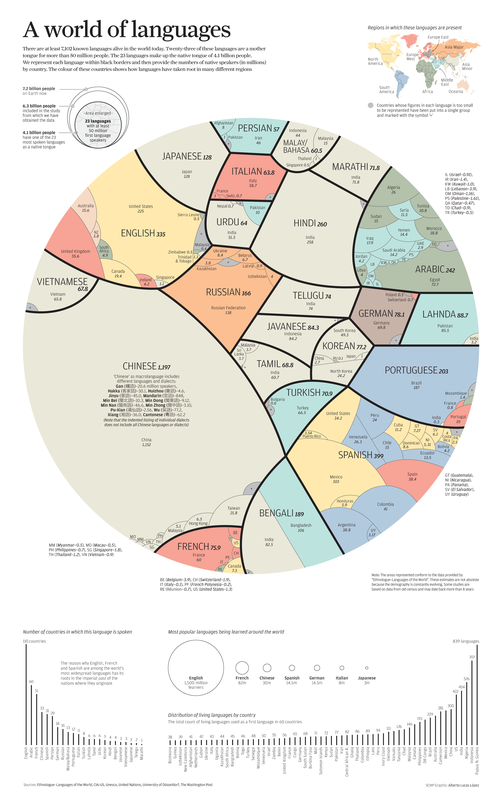 For example, A World of Languages. Did you know that 146 living languages are used as a first language in Malaysia? Unsurprisingly, there are lots of infographics to do with cycling. This one plots the increase in the number of riders who completed the Rapha Festive 500 between 2011 and 2014. For 2017, the number of roundel winners is above 19,000. More details about the 2012 and 2013 Festive 500s are presented in these infographics. Some activity-tracking sites produce individualised infographics. Strava is perhaps the most popular online cyclists’ community, with 203 million rides logged in 2017. Each cyclist using Strava can generate a movie summarising their own achievements in 2017. The closing graphic looks like this. Strava also lets members generate heatmaps showing where they have ridden during a user-selected time period. The color used highlight the routes changes from blue through purple to red, depending on how often that particular route has been ridden. Third parties can access Strava’s data to produce their own infographics. This is the heatmap produced by Jonathan O”Keeffe’s Strava Multiple Ride Mapper application. It improves on the native Strava heatmap by using a wider range of colors to indicate ride frequency. Veloviewer.com is another third-party application that pulls data from Strava to create individualized infographics. One is a variation on the heatmap, supplemented with the date, distance, and elevation of each of the rides within the user-selected date range. The more popular Veloviewer infographic, especially at year-end, is the one which tracks a variety of measures through the year. Madewithsisu.com uses your Strava data to produce art, rather than infographics in the strict sense of the word. Like Veloviewer, the user selects the time period from which data is to be used. Clocked represents each of your activities as a ring. They start when you started and finish when you finished. The Multi-Route plots the route of all your rides for the chosen time period. If you are interested in more infographics about cycling, like this one . . .
or this one . . .
then Velopedia: The Infographic Book of Cycling is the book for you. Posted in Cycling in Malaysia, Gear and Tools and tagged Rapha Festive 500, Sisu, Strava, Velopedia: The Infographic Book of Cycling, Veloviewer. Bookmark the permalink.